While bloggers often fall into the trap of overstating the importance and wider implications of new product releases by Apple, it's reasonable to suggest that the launch of GarageBand for iPad does have the potential to change the mobile music making landscape (you see, we've just done it). Update: You can now read our hands-on review of GarageBand for iPad for a detailed overview. With eight tracks of recording, guitar amps/stompboxes, 'smart' software instruments and compatibility with the desktop version of GarageBand, this $5 'mini DAW' could be the app that convinces you to take the plunge and buy an iPad. With this in mind, let's take a step back to consider the software's release and what it means. If you've been on the Apple Store in the last few hours you'll have noticed that the prices of the original have dropped considerably. So is now a good time to buy one? We'd say no: Apple is claiming that the iPad 2 is twice as fast as its predecessor, and you'll need that power if you want to run GarageBand (and, in all likelihood, many forthcoming iPad apps) effectively. One of the big disadvantages of many iOS apps is that, though they're great when considered in isolation, they're not compatible with your favourite desktop music making software. If you've already got a powerful desktop computer but have been thinking of buying a laptop for simple, on-the-go music making, GarageBand for iPad might be the software to convince you that Apple's tablet will do instead. OK, it's not as powerful or flexible as a MacBook, but if it does everything you need, who cares? This sounds like a strange argument, but consider that GarageBand for iPad is going to cost $5, and if it works as promised, you're going to be getting an awful lot for your money. So how are other iOS music making app developers going to compete? Those who are making non-traditional and/or performance-based products probably won't be concerned, but for any developer who's been thinking (or is in the process of) developing a DAW-style app, the performance bar may have just been raised considerably while the price ceiling has simultaneously been lowered. 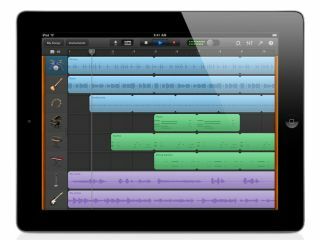 That's going to be a difficult pill to swallow, so rather than kick-starting a new wave of iPad music making 'studio' releases, there's a real possibility that GarageBand for iPad could slow things down and make other developers wonder whether there's any point in trying to compete. Will you be able to plug a MIDI keyboard, audio interface or USB mic into your iPad via the Camera Connection Kit and have it instantly work in GarageBand? We honestly don't know yet, though we suspect that it may be possible (in some if not all cases). It seems less likely, though, that GarageBand will be compatible with Line 6's MIDI Mobilizer, but we'll just have to wait and see. There are some music making apps on Android, but nowhere near as many as on iOS, and nothing to compete with GarageBand for iPad. However, there are many new Android tablets coming to market at the moment, some of which are more than powerful enough to compete. The challenge for developers is turn Android and the hardware devices that run it into a stable, low-latency music making platform. And they need to do it soon, or Apple's vice-like grip on the mobile music making market may never be loosened.